Shakti is the creator of the universe. The universe is her form. She is the foundation of the world and forms of the body. Shakti is the form of all things that live and move in the world. There is no jewel rarer than her, no condition superior to her! 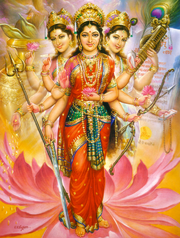 The concept of Shakti is also connected with Goddess Durga and Goddess Kali. Durga represents the power of the Supreme Being that preserves moral order and righteousness in the creation. Durga, also called Divine Mother, protects mankind from evil and misery by destroying evil forces such as selfishness, jealousy, prejudice, hatred, anger and ego. 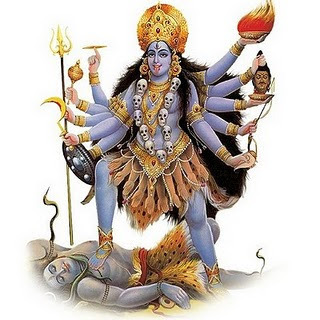 Kali is the fierce form of Parvati. She is a fierce protector and upholder of Dharma, although seemingly cruel at times. The Tamil month of Thai (Mid January to Mid February) has a great significance for Shakti worship especially the 4 Fridays that falls during this month. Transform your ltcha Shakti into longing for God. Convert Kriya Shakti into a force for doing divine actions. Sublimate your Jnana Shakti into divinity itself.